Headed for the “Show Me” State! A bad hair day for one musk ox! The Itchy Little Musk Ox is on the program at Missouri State University’s Literacy Awareness event, coming up October 4-8 at West Plains. I’m so excited to hear of a university that’s involved with its community in this dynamic way. MSU and corporate sponsors CenturyTel and Caterpillar helped make this year’s visit possible, so a big thanks to them. Each year, as many as 4,500 local students get to hear presentations by children’s book authors. I’m speaking during the first two days of the event, on Monday and Tuesday, Oct. 5-6, at the Civic Center. My groups of students are all Pre-K to 3rd-graders (my favorites! ), and they’ll be coming from the following area schools: Howell Valley, Koshonong, Dora, Bakersfield, Gatewood, Couch, Birchtree, Thayer, Southfork, Winona, Mt. View, Glenwood, Junction Hill, Fairview, WS Elementary, and Headstart. It’ll be fun to talk about Alaska and read from my books, Alaskan Night Before Christmas (in October! 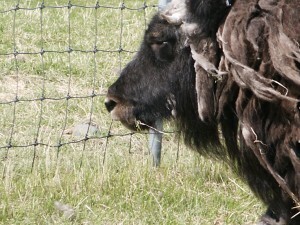 ), Groucho’s Eyebrows, and of course, The Itchy Little Musk Ox. Can’t wait to meet you kids! See you soon!